Extreme Kleaner, a new eco-­friendly cleaner is appearing on the shelves of selected hardware stores, local retailers, and on­line shopping platforms and is making a big splash nationwide with new video advert that has audiences laughing out loud. This popular new household, commercial and industrial green cleaner is made by a small company from Ogdensburg, New Jersey, Extreme Energy Solutions Inc. Extreme Kleaner, is a new non-­toxic, biodegradable, cleaner­-degreaser, uses a unique formula to address even the toughest dirt and grease and can also be used to help clean mold & mildew, rubber marks, and pet stains, kitchen equipment, car­ boat ­RV exteriors and interiors, and more. But as the old say goes, if it claims to be too good to be true well you know the rest. registration guidelines for proprietary substances and non­food compounds. NSF gave the company the authority to bear the NSF mark on its product and marketing materials, showing that the green cleaner is safe to use around food areas. Next we asked Beverly White, CEO and President of BKW Transformations Group to take a look at the product. BKW, located in New Jersey is a consulting firm that offers expertise and evaluations in the area of strategy, process, technology and organization transformation, and has extensive experience in these areas. BKW is also well known advocate for economic and environmental sustainability. We asked her to test Extreme Kleaner and tell us what she finds. “I used Extreme Kleaner on my light beige carpet. It was great. After directly spraying on the soiled spot and let set for about three minutes, I used a light colored cloth to message the area. The spot was totally gone. I detected no odor which is important for my allergies,” claimed Ms. White. We decided to put the product to one more test. We ran into Elly McGuire, the author of Schmitty the Weather Dog, a childrens book designed to focus on getting kids excited about the science, technology, engineering, and math. Ms. McGuire agreed to try Extreme Kleaner for her own use. Elly, with her partner, Meteorologist Ron Trotta, and even Schmitty himself decided to give the green cleaner and degreaser a try. McGuire provided an Extreme Kleaner testimonial video that showed just how effective the product was during her experience. Extreme Kleaner was initially brought to market by Extreme Energy Solutions in July of 2012, and since has been offered on­line, in local New Jersey stores, and recently in larger chain stores. The product can be found on Amazon.com, KeepAmerica.com, and direct from the product website ExtremeKleaner.com. 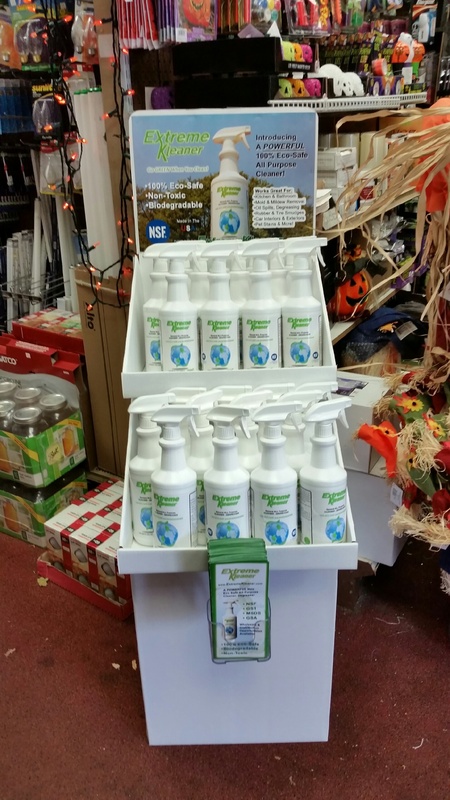 2013 brought another big year for the product as it was introduced to local retailers in Sussex County, New Jersey, which played host to the first stores who offered Extreme Kleaner. PostNet, a general purpose printing, shipping and receiving outlet in Jefferson, New Jersey was one of the first to offer the product to its customers. Later it was joined by the Floor Store in Hamburg, NJ, and then one by one, other retailers would join the ranks. In addition to retailers, Extreme Kleaner has been sold direct to end users such as Arrow Fastener in Saddle Brook, NJ, Dunkin Donuts in Stockholm, NJ and restaurants in the Northern New Jersey area as well. Extreme Kleaner soon became available in a number of True Value Hardware Stores, located throughout the tri­state area, including locations in New Jersey of Montclair, and Lincoln Park; Milford, Dingmans Ferry, Newfoundland, and in East Stroudsburg, Pennsylvania; as well as Port Jervis and Goshen New York. 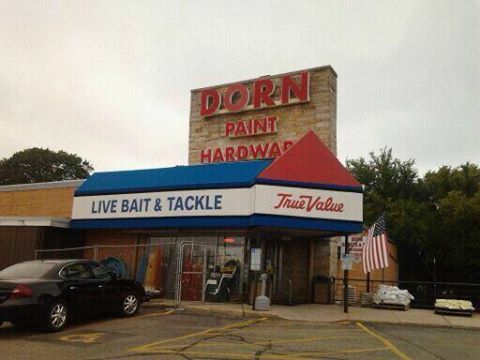 And even stores in Madison, Wisconsin have joined the ranks of new distributors. Extreme Kleaner has also been noticed by the press. Natural Awakenings Magazine recently featured Extreme Kleaner under its product spotlight segment in its October 2014 issue that covers southern Wisconsin readership. It was also highlighted on the show, Today in America, hosted and Narrated by NFL Football Legend Terry Bradshaw. The Ogdensburg, New Jersey Company and Samuel K. Burlum has been nationally recognized for its efforts in the green industry. It received the 2013 NOVA Award from the World Green Energy Symposium, at its New York City Conference. The Company and its CEO were also awarded a proclamation by the Passaic Valley Fraternal Order of Police Lodge 181 naming Extreme Energy Solutions as Passaic Countys 2013 Company of the Year in the area of Professional Environmentally Friendly Energy Products. Extreme Energy Solutions was founded in 2008 and began as a third party research and development consulting service firm, later transitioning into a developer, manufacturer, and distributor of other green products. Extreme Kleaner is Made in the USA, by being manufactured and packaged in New Jersey. The company is also a large supporter of veterans, as many of their staff have served in the military. The Philadelphia Parking Authority (PPA) is attempting to become more environmentally friendly, while saving some green at the gas pump, with their vehicle fleet. A selected group of PPA vehicles have been chosen to be retrofitted with the SMART Emissions Reducer as a 90 day study, to see if the SMART Emissions Reducer will help the PPA lower harmful emissions of vehicles they already have on the road. SMART Emissions Reducer offers the side benefit of fuel savings, assisting the PPA in some budget relief at the fuel pump. The trial began on March 11. Extreme Energy Solutions Inc. of Ogdensburg and Corporate Partner SMART Air Fuel Saver LLC, has dispatched their top technical team to handle the initial installation of the devices. Overseeing the project is John Primerano, Regional Representative for Extreme and Ken Henshaw, Fleet Manager for the PPA. Both teams will monitor the performance of the SMART device from an administrative and technical perspective, with input from the PPA, where officials will report back their fuel economy results. Primerano, with Extreme Energy Solutions Inc., says, “Should the vehicles experience the expected lower emissions and fuel savings numbers, as the SMART devices have delivered in the past, it would be a major win for the City of Philly to have technology that can deliver real green benefits and aid in reducing City budget costs”. Primerano is also a resident of Philadelphia. At the conclusion of the testing, emissions and fuel economy data will be reviewed. Upon completion of the review, the PPA will have an option to explore retrofitting their remaining fleet vehicles. Extreme Energy Solutions Inc. CEO/President, Samuel K. Burlum, who also is the Vice President of SMART Air Fuel Saver LLC, said that he was looking forward in partnering with the City of Philadelphia in testing the SMART device. “Our company is confident that the trial program will demonstrate positive results for the PPA, and are proud to partner with an agency that has taken the initiative to explore ways to lessen their carbon footprint, while saving taxpayer dollars,” said Burlum. You can check out the behind the scenes interview with Samuel Burlum, PPA, and 1060 AM News by clicking here. Extreme Energy Solutions Inc., was recently featured on Today in America, hosted and narrated by Football Legend and Sports Commentator Terry Bradshaw. Extreme will also be highlighted at the World Green Energy Symposium, this year held at Hunter College, in New York City, March 26. For more about SMART Emissions Reducer, visit smartafs.com, or www.extremeenergysolutions.net or call 973-209-3450. 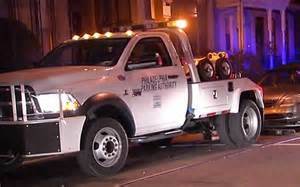 The Philadelphia Parking Authority is testing a new filtering device that claims to reduce harmful emissions in the agency’s vehicles while improving fuel economy. At the PPA’s fleet garage in Southwest Philadelphia this morning, CEO Samuel Burlum of North Jersey-based Extreme Energy Solutions pointed to one of the devices they are retrofitting in six PPA vehicles (photo). The Smart Emissions Reducer is made in the USA, goes on the pollution control valve side of the engine. 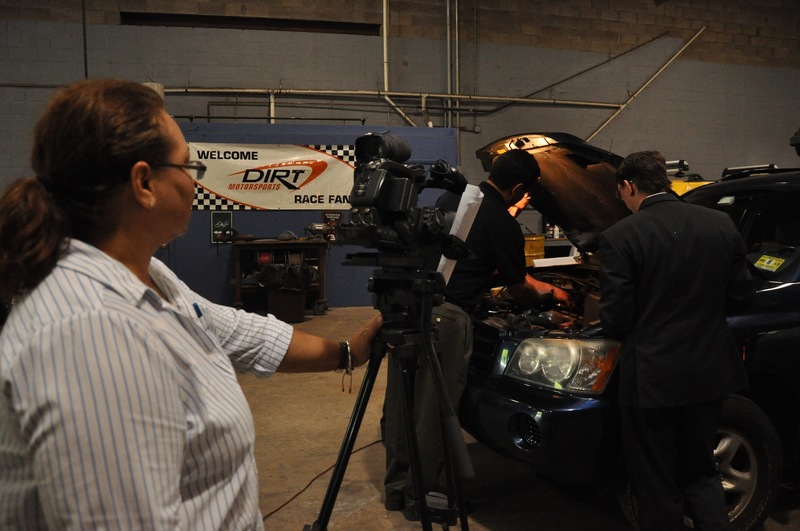 “What we end up doing is we take crankcase emissions, pass it through the device which acts as a catalyst, and it reforms the material into usable fuel,” Burlum explained to KYW Newsradio. Extreme Energy Solutions has lab-tested the “Smart Emissions Reducer,” which works like a catalytic converter, at the Roush Performance Center. Burlum says its clients are reporting a reduction in vehicle emissions by up to 50 percent or more, with at least a 5-10% increase in fuel economy. The Parking Authority will take the Smart device on a 90-day test drive with the vehicles it retrofitted, and report back on their results. You can see the behind the scenes video/audio inteview at www.SamBurlum.com or by clicking here. The device is being used in municipalities that have about 800 vehicles in Winnebago County, Illinois. It’s being tested in Nevada, West Palm Beach, Fla., as well as on Yellow cabs in Pasadena, Calif. 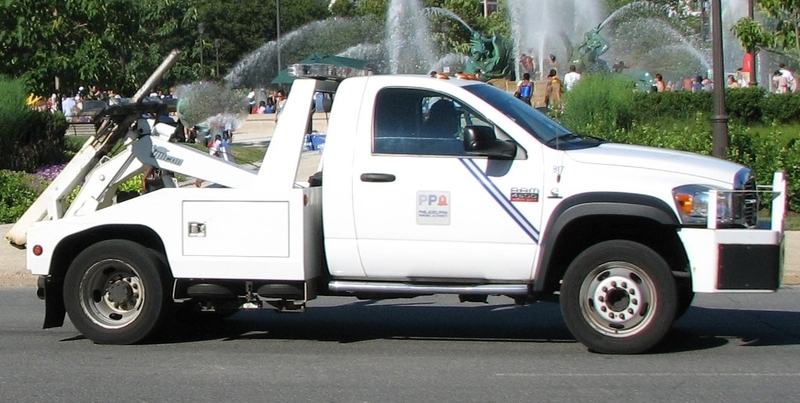 The Philadelphia Parking Authority (PPA) is attempting to become more environmentally friendly, while saving some green at the gas pump, with their vehicle fleet. A selected group of PPA vehicles have been chosen to be retrofitted with the SMART Emissions Reducer as a 90 day study, to see if the SMART Emissions Reducer will help the PPA lower harmful emissions of vehicles they already have on the road. SMART Emissions Reducer offers the side benefit of fuel savings, assisting the PPA in some budget relief at the fuel pump. The trial is set to begin on Monday, March 11, 2013. Extreme Energy Solutions Inc. (Ogdensburg, NJ) and Corporate Partner SMART Air Fuel Saver LLC of (FL), has dispatched their top technical team to handle the initial installation of the devices. Overseeing the project is John Primerano, Regional Representative for Extreme and Ken Henshaw, Fleet Manager for the PPA. Both teams will monitor the performance of the SMART device from an administrative and technical perspective, with input from the PPA, where officials will report back their fuel economy results. Primerano, with Extreme Energy Solutions Inc., says “Should the vehicles experience the expected lower emissions and fuel savings numbers, as the SMART devices have delivered in the past, it would be a major win for the City of Philly to have technology that can deliver real green benefits and aid in reducing City budget costs”. Primerano is also a resident of Philadelphia. Successful programs in other regions of the country include the municipalities of Winnebago County Highway Department (IL) who have already signed a contract to continue to retrofit their fleet with the device, and City of West Palm Beach (FL), who has been testing the device since 2011. The SMART Emissions Reducer is the only engine modification permissible by the New York City Taxi and Limo Commission. The SMART Emissions Reducer has been issued a CARB EO (California Air Resources Board Executive Order) #D-671. The SMART Emissions Reducer has also been lab tested by Roush Industries Inc., recording positive results. Extreme Energy Solutions Inc., was recently featured on Today in America, hosted and narrated by Football Legend and Sports Commentator Terry Bradshaw. Extreme will also be highlighted at the World Green Energy Symposium, this year held at Hunter College, in New York City, March 26, 2013. For more about SMART Emissions Reducer, visit the website http://www.smartafs.com, or http://www.extremeenergysolutions.net or call 973-209-3450. Here are just a few words from folks who have experienced what Extreme Energy Solutions and its Smart Emissions Reducer has to offer. Setting the bar…“I wanted to personally thank you (Extreme Energy Solutions) for your attendance, presentation and active participation at the Innovation Arena and during the overall Sustainability Summit 2012. I truly appreciate your time and efforts. The impact of any group of presentations is only as high as the quality of its presenters. To state the obvious, your presentation set the bar very high for the future.” -Edward Harrington, Certification Compliance Specialist, NY NJ Minority Supply Development Council. Results are very positive…“Published results from around the country indicate years of very positive economic, as well as environmental impact, using the SMART Emissions Reducer. The expected results for us are very important in light of higher gas prices, tighter budgets, and our desire to become more ‘green’ in our operations. Similar results here in Winnebago County are very positive.” –Dan Davis, Operations Manager, Winnebago County Highway Department, Illinois. As you can see, Extreme Energy Solutions has become a leader in providing emissions reduction-emissions reducing technology that provides a fuel economy-fuel efficiency benefit. The Company, lead by Samuel K. Burlum, has made significant progress in deploying the Smart Emissions Reducer on the worldwide stage. Extreme Energy Solution, located in Ogdensburg, New Jersey is a developer, manufacturer, distributor, and servicer of technology aimed in reducing environmental impact, lessening harmful emissions while helping people save money on gas fuel cost. Their game changing, ground breaking fleet technology is recognized all over the world. “Everyone’s a winner here, everyone crossed the finish line,” said Sussex County Sheriff Michael Strada Saturday morning, at the conclusion of the first Sussex County Crime Stoppers 5K/10K Run at the Sussex County Fairgrounds, to benefit the Sussex County Sheriff’s Crime Stoppers. The Sussex County Sheriff’s Crime Stoppers is a non-profit organization that helps lead to the arrest, and indictment of criminals, paying up to a $1,000 cash reward to the tipster. About an hour prior to the race start, a passing and strong shower briefly hovered over the area, and then cleared. The sun returned, along with some humidity, with an occasional passing cooler breeze. “It’s good to see the sun,” Andy Ball of Main Street Marketing and Events, who organized the 5K/10K event. Ball, said both courses were USA Track & Field (USATF) sanctioned. The 5K started and ended within the fairgrounds, and the 10K on Plains Road, with the same finish line as the 5K. Within the park, Ball asked participants of the 5K to first pause before the race for a moment of silence to remember the victims of September 11. “We want to thank all of our military, our veterans, and all those who passed on,” Ball said, and the crowd cheered. The race then started moments at 9:30am, with the group taking off. 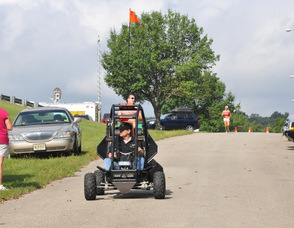 The 5K was led by Samuel Burlum, CEO & President of Extreme Energy Solutions, driving in a Sidewinder ATV, a low emissions vehicle sold by his company. The 10K was led by a Sussex County Sheriff’s Car. There were 54 participants in the 5K, and 51 in the 10K race. Out of the 105 participants, 65 pre-registered for the event. Brian Thomas of Ogdensburg was the overall winner of the 5K, with a total time of 20:25.2, followed by Catherine Stone of Hardyston at 20:36.0, Philip Gely of Newton at 22:50.9, and Howard Condit of Vernon at 23:10.9. In the 10K, Stefan Alvinsson of Sandystown, N.J. finished at 38:56.0, Jeff Staple of Aambury, N.J., at 40:27.1, and Bill Bosmann of Rockaway, N.J. at 40:27.1. For complete results of both races, click here. “I’m a lifelong runner, I’ve stayed with it, and it’s about doing something consistently,” said Thomas. Eileen Cawley, a personal trainer from Lafayette, was another 5K participant. She placed number 15 overall, and had a time of 28:50.7. She ran with her daughter, Emma, who placed first for females in the 12 through 14 age group, and came in 21st overall, with a time of 30:18.6. Janet Dashio of Sandyston ran in the 10K. She was one of three participants from the Department of Child Protection and Permanency (formerly DYFS). She raced with co-workers Michele Quinn, and Judy Connell. “We’re supporting our sheriff’s department,” Dashio said after the race. She described the air on the course as “heavy and humid” for the day. It was Dashio’s third 10K, and she has run many 5K’s, she said. Joe Farinella of Andover Township was the oldest registered participant at 73 years old. Farinella participated in the 10K, after having only started running at age 68. He has run in the Goofy Challenge in Disney, and the New York Marathon, among his accolades. “I love running,” said the retiree from Picatinny Arsenal. “We’ll see what happens today,” Farinella said before the race, describing his average time for 5K’s at “28 and change”. For the 10K, Farinella clocked in at 59:12.9, coming in number 34 of 51 participants. Trophies were handed out for the top participants, and then ribbons in blue, red, and white, for first, second, and third place participants in each category. Strada said for anyone who was not present to receive their ribbon at the end of the race, to please contact Lt. Larry Beller at the Sussex County Sheriff’s Department at: (973) 579-0865, extension 2501. Richard Bunce, Hopatcong Councilman, and Chair of the Sussex County Sheriff’s Crime Stoppers, said the group is seeking more commissioners, and encouraged attendees to volunteer. “It’s a very worthy organization,” Bunce said. “I see a lot of families here today, I really appreciate it, we at the Sussex County Sheriff’s Office, really appreciate your support,” Strada told the participants before handing out the awards. The Sussex County Sheriff’s Crime Stoppers 5K/10K Run was presented by Thorlabs. Other sponsors included: Adam Todd Caterers, The Alternative Press of Sussex County, Athenia Mason Supply, D&H Alternative Risk Solutions, Eastern Propane, Extreme Energy Solutions, Extreme Off Road, GBW Insurance, Glen Vetrano, Hardyston Township PBA Local 374, Jersey Gators Swim Team, Lakeland Bank, Madsen Construction, The New Jersey Herald, PSE&G, The Printing Center, R&T Nautilus, Royal Buick GMC, St. Clare’s Health System, Senator Steven Oroho, Sheriff Michael Strada, Subaru World of Newton, Sussex County Community College, Sussex County Fairgrounds, and Sussex County Imports. For more information about Sussex County Sheriff’s Crime Stoppers, or to submit a crime tip click here to fill out an online anonymous tip form, or call in tips to: (973) 300-CRIME.